From PayPal to Tesla to SpaceX, Elon Musk has been one of the leading innovators of our age—a modern-day Thomas Edison ushering mankind toward a better future. And it looks like he has once again found a brilliant solution to one of mankind’s most pressing problems: Musk just announced that he is currently developing a lemon with legs that can sprint to hungry people all over the world. 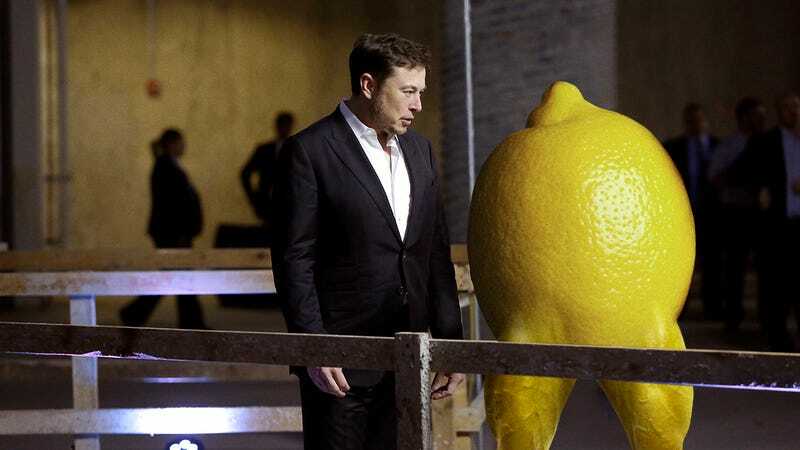 Earlier today, Musk revealed that he has been working with scientists for the past three years to genetically engineer a lemon that has big, muscular human legs and can sprint in the direction of people facing starvation. When the lemon arrives, the lucky recipients can eat it, thus completely eliminating their poverty. Musk gave the world a glimpse into the amazing project by tweeting out a video of a lemon with human legs stumbling around a parking garage with the caption, “Just a little something I’ve been working on.” Although the lemon still has trouble balancing and can only sprint for five miles at a time before collapsing from exhaustion, Musk says he hopes the lemon will be able to sprint for up to 2,000 miles at a time by the end of this year. The SpaceX founder has been working with the best engineers and scientists in Silicon Valley and says that initial tests of the lemon with legs have been horrible, but that the thousands of problems they’re encountering will probably go away on their own without anybody doing anything. One of the most pressing issues is that the lemon does not have any eyes, so in order to successfully sprint toward a starving person, that person must constantly scream at the top of their lungs so that the lemon knows which way to sprint. Another difficulty Musk and his team have faced is that creating a lemon with human legs required murdering an honest, hard-working man in order to harvest his DNA. Musk says that he did not like murdering the man, but that sometimes murder is the only way to get fruit that has powerful human legs. He also notes that, despite some early production challenges, the lemon with legs is already generating serious excitement: The project has attracted swarms of investors from Silicon Valley, and venture capitalists have reportedly provided upwards of $2.6 billion in funding for the project so far. A handful of vocal detractors have criticized Musk’s lemon with legs project by claiming that a single lemon cannot provide a starving person with enough nutrition to survive, but Musk has dismissed these naysayers by claiming that they are all pedophiles. Check and mate! This is absolutely brilliant. Only someone as ingenious as Elon Musk could think of such an elegant solution to a daunting problem like world hunger. We can’t wait to see this lemon sprinting all over the place providing much-needed food to struggling people around the globe! UPDATE: According to new reports, Elon Musk has murdered his lemon with legs after it kicked him in the groin.